I've tried to avoid featuring any one label too frequently, but am making an exception today. 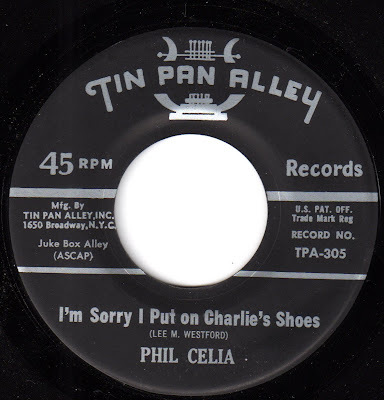 Even though I have already featured Tin Pan Alley this month, this one just came my way, and I'm too enamored of it to wait to share it. Seeing the names of each side of this record, I knew that either one of them (or both) could be a killer of a weird, wonderful number. In my opinion, the winner of the blue ribbon is "Charlie's Shoes". It's got a peppy setting, a nice combo backing, and some truly peculiar lyrics, which are fairly well locked into the 1950's setting into which they were born. That's not to say that "Tin Cans" isn't also in the running. 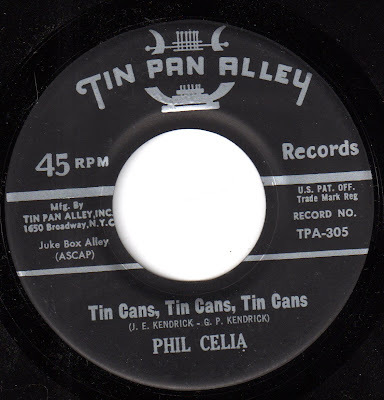 It's got a downright odd melodic setting (although it's also one I've had trouble getting out of my head), a jazzy feeling, and some more deeply idiosyncratic lyrics (I, for one, have never thought of tin cans as being lonely). Plus, it features a solo (a very nice one, too) played on an instrument that I'm pretty sure I've never heard given a solo on a song-poem record before. I'll let you discover the details of that magic yourself. Here's one for the "what the hell" file. 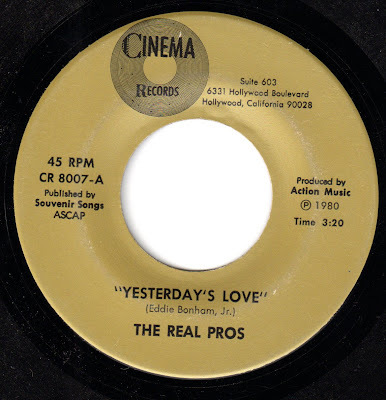 "The Real Pros" were, of course, whoever the Cinema Label people got for that particular session. No doubt there were actual pros on this session, but you'd be hard pressed to prove it based on the lifeless performances captured on this 45. 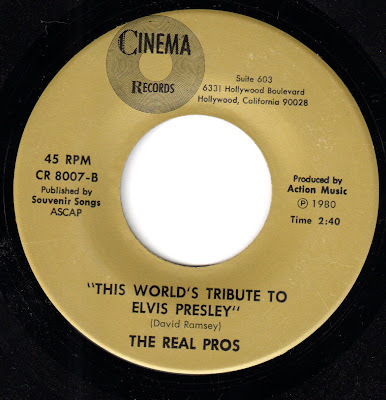 I actually bought this record because of the promise in the title of the flip side, "This World's Tribute to Elvis Presley" (the use of "This" instead of "The" in that title cracks me up). Alas, although it, too, is fairly ridiculous, in the end it's just another fairly bad song-poem. Aside from more barely adequate musicianship, it's distiguished only by it's subject matter, which may cause it to be of more interest to some listeners. 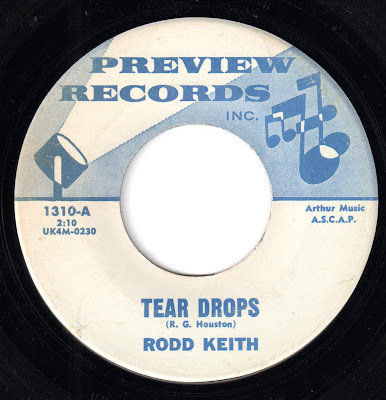 While I try to deal with a sudden (and significant) computer problem which cropped up in the last couple of days, here's a nice single from the early days of the Preview label, from none other than Rodd Keith. 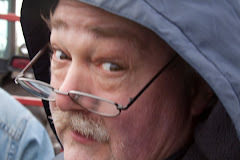 The A-side is a nice piece of country flavored pop, titled "Tear Drops". I really like the interplay between Rodd and the backing vocalists on the bridge, particularly on the unlikely line "combing my hair". 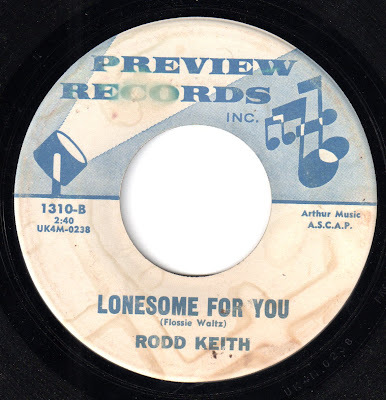 The flip side, "Lonesome For You", is not nearly as interesting to me, sounding a bit like the bland material that Mitch Miller produced for Guy Mitchell in the early '50's. It does, however, have the benefit of having been written by one Flossie Waltz, who is (or was) the rare person whose name could also be a dance step. What Dance Did You Dance on New Year's Eve? 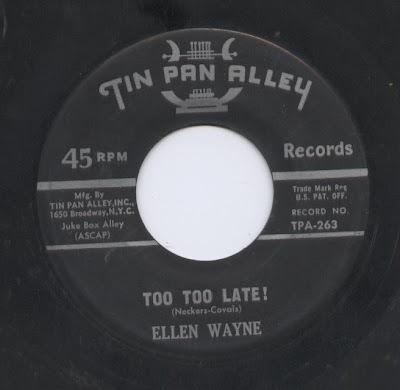 The flip side, "Too Too Late", also by Ellen Wayne, is beat to hell, and I've tried to clean up the sound as best as I could. This is a pretty standard late '50's ballad, without too much to recommend it either way, aside from one truly sloppy note on the solo. 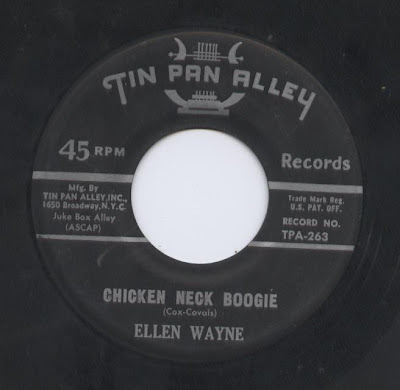 I do wish that the composer, one Mr. or Ms. "Neckers" had been the composer of "Chicken Neck Boogie" though, but that's probably too much to have asked for.